Helms score 60% of the total races. Races not sailed are scored as 15 (being one point more than the expected number of qualifying helms in the season) not shown on the chart until scoring is affected. RUTLAND eased the season in with two days of light SSW breeze at Rutland 8th-9th April (Report and photos) with the fleet joined by new helm Mike Gough. In close racing on both days, Gareth Ede came through to the front to take four wins from six races, with John Terry taking the other two, the light breezes and balmy sunshine made the start easy, tempered by the tactical decisions (and need for patience) as the breeze swung unpredictably. Then Catapult was back to BASSENTHWAITE for an established favourite, the May Bank Holiday meeting.With strong breezes forecast, three races were squeezed in on Saturday, ahead of the threatened easterlies, which duly arrived to prevent Sunday's schedule (Report and photos). A closely-fought duel between John Terry and Gareth Ede dominated the event. John was leading after Day 1, but it all came down to the last race on Day 3. Gareth lost ground due to a penalty turn, but then in the sparkling breeze he progressively turned the screw on John catching him and going on to build a solid lead. Gareth was able to discard a 3rd place acquired when he was beaten by his dad Stuart (how did that happen?!) so his scoreline matched John's place for place, and he just snatched the top prize on tie-break. NORTHERN CHAMPIONSHIP AT YORKSHIRE DALES Catapult was back at Yorkshire Dales SC, high up on the moors on Grimwith Reservoir, September 31st-October 1st, for the Northern Championship, sharing the weekend with the D Zeros and Contenders. 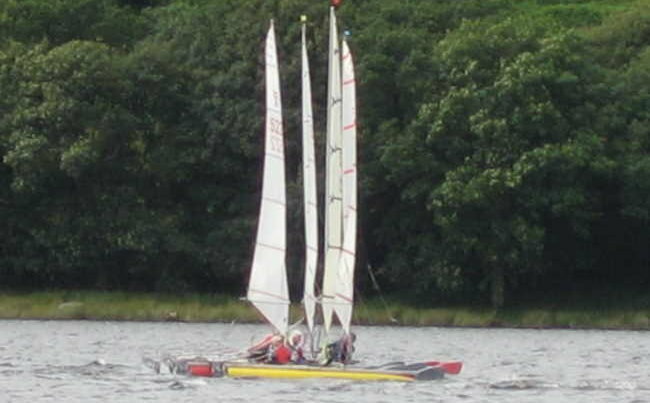 On Saturday a hard westerly had dark water and whitecaps down the lake, and the Catapults elected not to launch, watching sympathetically from the panoramic windows of the clubhouse as the two other fleets tackled a "P" course with three gybes,which took out almost every helm until the race was abandoned. Sunday went the other way, with four races in a light fluctuating WSW under sunshine, needing careful boat-speed, and luck in the shifts. Gareth Ede and John Terry got consistently to the front, and tied with two firsts and two seconds each, Gareth snatching the Northerns on countback. Stuart Ede took third on count-back from Alastair Forrest, and one point covered the next three places, with Syd Gage edging out Mike Gough on count-back to take the fifth place. NATIONALS AT BRIDLINGTON: The Royal Yorkshire YC Dinghy section hosted the 2017 Nationals over the August Bank Holiday weekend, with 10 boats racing, and new member Marcus trying the boat out. Brid again produced real open water sailing and good racing breeze for all three days, with a testing final race as it piped up.